5 Point safety harness with breathable seat cushion. The Q Play Ni:CO 6-in-1 Trike Blue can adapt to 6 different modes! This trike will grow with your child from 12to 36 months. Designed for comfort, the NI:CO Trike features a rotating and reclining seat with a removable footrest and a 5-point safety harness to keep your little one secure. You can keep everything you and your little one need in the removable storage bag. 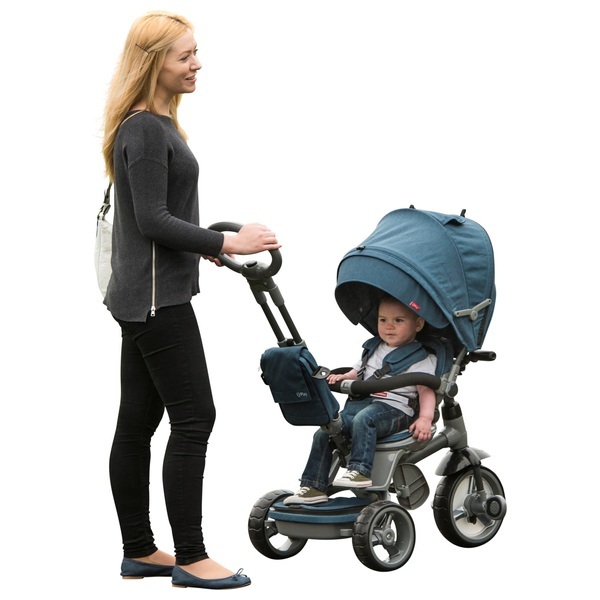 The adjustable telescopic parent handle, foot brake and freewheeling function allow you to easily steer and control the Q Play NI:CO Trike Blue while in the parent mode. Mode 1: In the first mode, suitable from 12months, parent and baby are in a face-to-face position, allowing for direct child supervision. Features such as pedals, the front handrail and back support can be removed until your child is ready to use them. Modes 2-3: When your child is ready, you can turn the seat back to its original position. Choose the infant or small child's footrest mode based on your child's age. The footrest is also removable. Mde 4: Transform your trike to riding mode! The front handrail and pedals will transform the Q Play Ni:CO Trike Blue from pushchair to trike. The adjustable telescopic parent handle will help you to guide your little one as they ride the trike themselves. Mode 5-6: When your little one is confident enough to enjoy independent trike riding, the Q Play Ni:CO Trike will be ready too. Just remove the back support and parent handle to transform into full trike mode. EU Warning: Parent supervision required.